The four elements inspired these colorful handcrafted glasses. Old friends, a great bottle of malbec, and colorful conversation: All the elements of an ideal evening were in place. Wait: you mean wine isn't an element? Inspired by more traditional elements—earth, air, fire, and water—Mariel Waddel Hunter and Alexi Hunter's lively stemless goblets would fit right in. Each one starts with a gather of hot, clear glass that's rolled in frit—a confetti-like collection of crushed, colored glass. Mariel and Hunter pinch three tactile twists into the sides of each glass to swirl the colors. 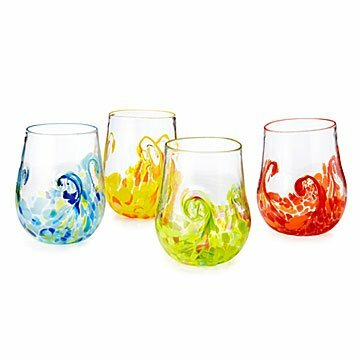 Each set of four glasses adds a playful splash of color to your favorite beverages and occasions. Handmade in Kingston, Ontario. I am sure these will be reserved for wine and special occasions, although I can see other using for every day I would feel apprehensive. They are pieces of art and the attention to detail clearly shows in every piece. I love holding them up to the light - each has an ellectic story to tell. I am so happy to have found this website and the artists that will help my daughter's Christmas be very special. I am also placing a wine of the month club certificate in the box with the glasses. I was given these for a wedding gift....so beautiful! Proud to own them, pieces of art. Fantastic drinking glasses! Very comfortable in the hand. Bought these for a myself as well as another set for a gift. I use them for everything including my wine. Love the different colours so everyone knows which is their glass.